Nailya Alexander Gallery is pleased to present a new installation by Irina Nakhova, Probably Would. This site‐specific photographic environment will be the artist's fourth one‐ person show in New York. Nailya Alexander Gallery is located at 24 W. 57th Street, #501, NYC, 10019. Gallery hours are Tues.‐Sat., 11 a.m.‐6 p.m.
For this exhibition, Nakhova will mesh and layer large photographic images to transform the entire gallery into a giant three‐dimensional cityscape that spans all four walls and the floor. She will convert the gallery space into a visual continuum without beginning or end, a dreamlike landscape that envelops the viewer in both the altered physicality of the actual gallery and the constructed landscape created by the images. Photographs from the four years Nakhova lived on Fulton Street in New York (busy afternoons when Fulton and Nassau were closed to car traffic, a ticker‐tape parade for the Yankees, a winter blizzard, and finally pictures that were taken in September 2001) are seamlessly collaged into a 360‐ degree urban landscape of the intersection of Fulton and Nassau streets. When visitors walk into this landscape, the images' perspective gives them a sense of being elevated to the second‐ or third‐ floor level, as if floating in space among confetti or swirling snowflakes. As the forms of nature intrude, the cityscape becomes partially obscured and fragmented by thousands of organic shapes, united in a round dome of overarching architectural space, producing a feeling of spinning into the illusionary vortex of a shifting, crumbling reality. Born and educated in Moscow, Irina Nakhova was among the younger generation of Russian nonconformist artists known as the Moscow Conceptual School. 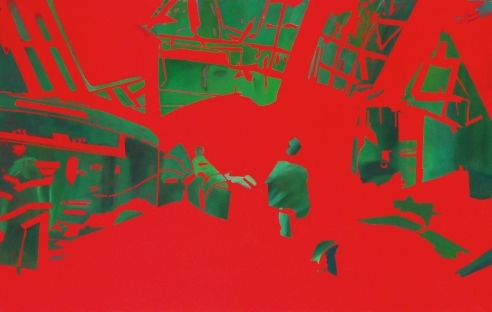 Her first one‐ person show outside of Russia was Partial Triumph I, in 1989 at Vanessa Devereux Gallery, London, followed by Momentum Mortis at Phyllis Kind Gallery in New York in 1990. Among her recent projects are Artificial Shrubbery at the State Tretyakov Gallery in Moscow (2005), Alert: Code Orange at the National Centre for Contemporary Arts in Moscow (2004), and Silence at Galerie im Traklhaus in Salzburg, Austria (2004). Nakhova combines painting, sculpture, and new technology into interactive installations and environments that engage viewers as co‐creators of new conceptual mindscapes. The artist's first monograph, Irina Nakhova Works 1973­2004, was co‐published in 2004 by the Salzburg International Summer Academy, Austria, and the National Centre for Contemporary Arts, Moscow, Russia.